Afghanistan’s rival presidential candidates may reach a deal on how to share power late on Tuesday, according to Afghan and Western officials, potentially ending months of tension over the outcome of a run-off election held in June. The struggle to find a successor to President Hamid Karzai, who has held power since the Islamist Taliban were ousted in 2001, has destabilized Afghanistan and paralyzed its economy just as most foreign troops withdraw. Both teams have confirmed that the candidates have discussed a new plan for the national unity government they agreed to form back in August following meetings with U.S. Secretary of State John Kerry. According to Abdullah’s camp, the two campaigns have agreed that the Chief Executive will serve as the Chairman of the Council of Ministers. “An agreement has been made on one of the disputed points regarding whether the Chief Executive will also serve as Chairman of Council of Ministers,” Abdullah spokesman Syed Aqa Fazel Sancharaki said Monday. Meanwhile, the Ghani campaign has maintained that the elected president will serve as head of government and Chairman of the Council of Ministers. “The presidential order will certify the job descriptions of the Chief Executive and his vices and the elected president will be head of the government and Chairman of Council of Ministers,” Ghani spokesman Faizullah Zaki said on Monday. During the announcement, IEC acknowledged the fact that the June 14 run-off elections witnessed massive frauds. Bakhtyari hopes that the audit process will re-establish people’s trust in the election process. Wow. So security forces, governors and IEC employees all took part in the fraud? Those are the very people who were supposed to assure voters that the process would be fair and impartial. But don’t get the impression that this admission and the tossing of results from 1028 polling stations will change anything. Although that sounds like a lot of votes being tossed, keep in mind that there were around 22,000 polling stations, so this move will have very little impact on the final vote tally. What is clear is that this final adjusted vote tally will have to be announced soon. What is not clear is whether Abdullah will accept the result that is certain to say that he lost. Just how he and his supporters react to the final announcement will be the most important decision in Afghanistan’s fate over the next few years. A gathering of leaders from NATO countries this week was supposed to be an opportunity to celebrate the close of the alliance’s long war in Afghanistan and to embrace the country’s new president. But it’s hard to have a party without the guest of honor. Despite smiling promises to Secretary of State John F. Kerry last month, two rival candidates to succeed Afghan President Hamid Karzai have failed to resolve a disagreement over a review of disputed election results in time to declare a winner. As a result, there will be no Afghan head of state at the NATO summit in Wales. Gosh, John Kerry just can’t understand Abdullah Abdullah. Why can’t he be the man Kerry was, and, “for the good of the country”, go ahead and concede in the face of evidence the election was stolen from him? Alternatively, why didn’t Kerry insist that Afghanistan’s Supreme Court just select a winner in the election dispute, so that the country can “move on”? After all, that worked out so well for the US (and, indirectly, for Afghanistan) in 2000. NATO Secretary General Anders Fogh Rasmussen made the best of a disappointing situation at a news conference Monday. Taliban called for an end of foeign [sic] military occuption [sic] in a bid to end the crisis in Afghanistan and inisted [sic] that complete withdrawal of foreign forces is the only successful solution. The North Atlantic Treaty Organization (NATO) summit is scheduled to be held this Thursday and Friday on September 4-5 in Wales where the 28-nation alliance will discuss and decide the financial and security assistance to Afghanistan. Representing Afghanistan will be Afghan Defense Minister Gen. Bismillah Mohammadi, given that a president has not been elected yet. Afghan political analysts hope that the absence of a new president will not change NATO’s stance on Afghanistan and continue to be committed to the country after the formation of a national unity government, stressing that the summit will significantly impact the nation’s future. The NATO Chicago conference had pledged to provide $4.1 billion to the Afghan National Security Forces (ANSF); however the Afghan government has announced that the overall financial obligations of the forces are currently about $6.1 billion. Gosh, even as Afghanistan melts down, graft training and arming Afghan troops remains a growth industry. This year’s summit has been called the most important conference in the past 70 years. Poor NATO. They’re hosting the most important party in 70 years and yet they have no boyfriend to bring to it. Go ahead, NATO. You can cry if you want to. John Kerry has made not one, but two trips to Afghanistan to pursue his extra-constitutional “power sharing” agreement between Ashraf Ghani and Abdullah Abdullah that creates the completely new position of chief executive within the Afghan government. As was easily predicted, that plan now teeters near total failure. Clearly, Afghanistan’s constitution means nothing to John Kerry in his pursuit of US goals in that country. MS. HARF: He’s the prime minister, period. QUESTION: So you’re not calling for Prime Minister Sharif to step down? MS. HARF: I in no way am calling on that. QUESTION: Does the United States support regime change in Pakistan? MS. HARF: We support the constitutional and electoral process in Pakistan, which produced the Prime Minister of Nawaz Sharif. That was a process they followed, an election they had, and we are focused on working with Pakistan. And we do not support any extra-constitutional changes to that democratic system or people attempting to impose them. How about that? In Pakistan, the State Department does “not support any extra-constitutional changes to that democratic system or people attempting to impose them”, while just across the border in Afghanistan, the Cabinet member in charge of the State Department is putting a huge amount of his own energy into an extra-constitutional change to the democratic system there. With millions of Afghans across your great nation braving violence and intimidation to cast their ballots, it is critical that all parties honor those voters’ aspiration for a democratic, peaceful transfer of power that unifies the country. We will continue to strongly support the democratic process and the agreement reached between the two candidates concerning the formation of a national unity government. With a timely resolution of the election and the signing of a Bilateral Security Agreement, I am confident that the next year will open an important new era in U.S.-Afghan relations. For John Kerry, as well as the rest of the US government, it always has been and always will be about keeping those troops going (and those military contracts running). Postscript: Did you notice the *asterisk above? I felt compelled to add it when I said that for the US, the constitution in Pakistan is of prime importance. There is a huge exception to that statement. The democratically elected government of Pakistan, whose constitutionality Harf is praising in her briefing, means absolutely nothing to the US when the US wishes to carry out a drone strike inside Pakistan’s borders, even when that same democratically elected government has made it clear that such actions are a violation of sovereignty. Two photos from Reuters today sum up the status of the Afghan presidential election. Ghani appears confident and ready to work with Kerry, while Abdullah gives Kerry the side eye. Three short weeks from tomorrow marks the date on which Afghanistan’s new president is to be sworn in. The problem, though, is that Abdullah Abdullah refuses to believe that he could have beaten Ashraf Ghani by a million votes in the first round and then lost to him by a million votes in the runoff a few weeks later. Both US Secretary of State John Kerry and the UN have tried to defuse the crisis, but neither effort has had any effect whatsoever. No words are needed to describe Kerry’s failure. In their story on Kerry’s visit to Kabul today, Reuters carried photos of Ghani and Abdullah with Kerry in front of the same backdrop of US and Afghan flags. The photo of Ghani and Kerry could pass as a propaganda photo handed out jointly by the two governments to promote a continued relationship between the US and Afghanistan with Ghani as the new president. 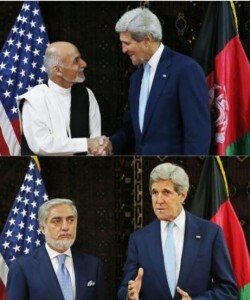 The photo with Abdullah, on the other hand, shows a deeply distrustful Abdullah casting a sideways glance at Kerry, who seems not to have the courage to look Abdullah in the eye, let alone shake hands as he did with Ghani. Perhaps Abdullah and Kerry did shake hands, but photographer Jim Bourg seems to have captured the essence of the crisis perfectly. The United Nations proposal centered on a special audit of suspected fraudulent votes, and it appeared to be a winner when the office of President Hamid Karzai called reporters shortly after midnight Friday, the beginning of the Afghan weekend, to spread the news of the new plan. Aimal Faizi, the spokesman for Mr. Karzai, said the president was backing the proposal, which involved a deeper audit of votes from 8,000 polling stations, or about 43 percent of the 8.1 million ballots cast. The plan had been presented to Mr. Karzai on Thursday evening by Jan Kubis, the special United Nations envoy for Afghanistan, who was to brief Mr. Abdullah and Mr. Ghani about it later on Friday, Mr. Faizi said. But within minutes, Mr. Abdullah’s campaign said it had already made clear to United Nations officials that the plan was not acceptable during discussions on Thursday about possible ways out of the crisis. A senior aide to Mr. Abdullah said the campaign had its own plan, which would entail audits of votes from about 11,000 of the roughly 22,000 polling stations. Western reports on the election crisis that I have read have danced around a very important central issue without ever addressing it. The huge problem that Afghanistan faces is that there is no real way to audit this election after the fact. Elections in Afghanistan do not take place in the way that elections in the West are conducted. Once outside of Kabul, Afghan society is structured around village life and women often live their entire lives without going outside the walls of the family compound. Village elders carry huge influence for all residents of the village. Khaama Press photo of June 27 Kabul protest in favor of Abdullah Abdullah. Last week, Abdullah Abdullah angrily withdrew his support of the runoff election process when he released audiotapes purported to be the voice of the head of the Independent Election Commission urging his staff to stuff ballot boxes. Although Afghanistan continues counting ballots and has announced that the July 2 scheduled date for releasing preliminary results will be met, Abdullah still has not rejoined the process. There is an argument between Abdullah and the Electoral Complaints Commission on whether he has actually submitted a formal complaint regarding the Zia-ul-Haq Amarkhail audiotapes. Abdullah’s response is to say that since the ECC won’t act, he is now submitting the material directly to the Attorney General. Afghan presidential candidate Abdullah Abdullah’s electoral campaign team released an audio tape of Maidan Wardak provincial governor on Thursday, in which the governor persuades an unknown “army officer” not to prevent ballot-stuffing in the June 14 runoff. Governor Attaullah Khogyani of Maidan Wardak, a province at the south-west of Kabul, speaks on the phone with the officer who asks the governor whether his unit should prevent electoral fraud in a district, according to the tape released in a live press conference. The governor tells the army officer that fraud prevention was not a task for the security forces and encourages him to speak to a Member of Parliament, Kalimzai Wardak, a supporter of Abdullah’s rival, Ashraf Ghani Ahmadzai. The footage which was also released on Thursday shows men in a room in the eastern Paktika province, as Abdullah’s team said, stuffing the ballot boxes for Mr Ahmadzai. The stuffed boxes were confiscated by the security forces, said Mr Shilgari. 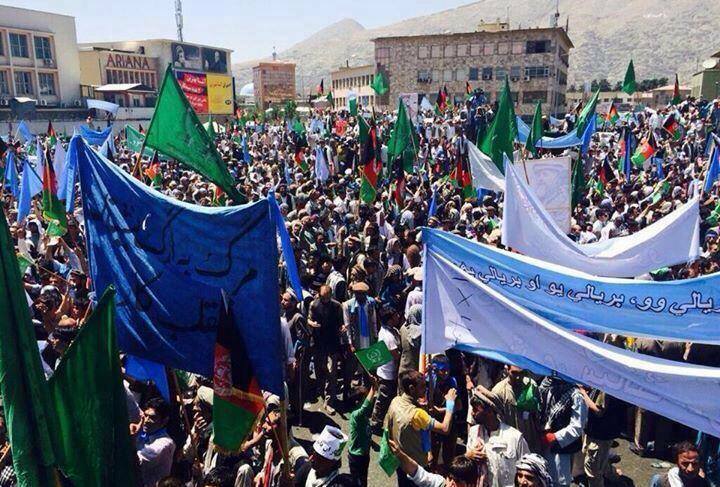 Thousands of protesters have taken to the streets of Kabul City on Friday marching alongside Abdullah Abdullah in protest of frauds that took place in the presidential runoff elections. Several roads in Kabul have been blocked as the demonstrators advance toward the Presidential Palace calling on the government to invalidate the rigged votes. Protests have begun in several areas of Kabul City that are joined by Dr. Abdullah and his running mates, the High Peace Council Chair, Salhuddin Rabbani, Mahmoud Karzai—brother of President Hamid Karzai—and Amirullah Saleh, former Afghan intelligence chief. Thus far, there have been no reports of security threats. The demonstration is continued peacefully. Demonstrators shouting “Death to Ashraf Ghani” and “Death to Karzai” marched past government buildings and the gate to the presidential palace. Mr. Abdullah, riding atop a truck, greeted supporters chanting their support. I wonder how Mahmoud Karzai felt about those “Death to Karzai” chants. A member of the Ghani team, former candidate Daud Sultanzoy, said on Friday that based on information from election observers it predicted a lead of about 1.2 to 1.3 million votes over Abdullah. “We want the mujahideen back. We don’t want technocrats and slaves of Jews and Christians,” said Badam Gul, a former mujahid. Wednesday is shaping up to be a very important day as Afghanistan faces a highly uncertain future. One of the most enduring formulas throughout the nearly 13 year US quagmire in Afghanistan has been the persistent claims by our military and their fans that we are making tremendous progress and that the Taliban has been weakened significantly. That formula held true in spectacular fashion for the Afghan election, with broad instant claims of how successful and peaceful voting was. But alas, once real information started coming out, it turns out that election day was in fact extremely violent. Even less noticed is that the facilities of the Independent Election Commission have been attacked since the day of the vote and now it appears that there will be a delay in the runoff election because of that attack. As if that blow is not enough, the “weakened” Afghan Taliban has now announced the date for the start of their spring offensive and have provided a long list of the types of targets they will attack. The International Security Assistance Force congratulates the people of Afghanistan on today’s historic election. Today’s success clearly demonstrates that the Afghan people have chosen their future of progress and opportunity. As the world watched, Afghan National Security Forces provided the opportunity for the Afghan people to choose their new President, securing over 6,200 polling centers across the country. Soldiers and policemen confidently patrolled the cities and countryside to protect innocent civilians and prevent insurgents from disrupting today’s elections. Afghan voters displayed confidence in their army and police, turning out in unprecedented numbers to cast their ballot for the future of Afghanistan. But on voting day, the country seemed unusually calm, prompting Afghan politicians to speculate that the Taliban had intentionally allowed the election to proceed. The statistics tell another story. Data released Monday by the U.S. military in Kabul show that April 5 was, in fact, an unusually violent day, spiking far above the norm, although falling 36 percent short of the peak number of attacks during the 2009 election, one of the bloodiest days of the war. Of the 286 insurgent attacks during this election, the vast majority (226) occurred in eastern Afghanistan, followed by 21 in the Kandahar area of southern Afghanistan, 17 in the west, 14 in the north, seven in the Helmand region and just one in Kabul. Independent Election Commission (IEC) Chairman Ahmad Yusuf Nuristani admitted on Wednesday that the runoff round expected between Abdullah Abdullah and Ashraf Ghani Ahmadzai could face delays. A runoff is required by Afghan law if no presidential candidate gets over 50 percent of votes in the first round. As of now, no one has passed that threshold. Although the runoff round was originally scheduled for May 28, election officials have said a number of setbacks have made it more likely that the round will be delayed. Mr. Nuristani cited the Taliban’s attack on the IEC’s headquarters in Kabul as the cause of the delay. “The election law says that a run-off must be held two weeks after the final results’ announcement, but the Taliban launched a rocket attack, and as a result of the attack we lost some of our critical materials, therefore, we will not be able to hold a run-off after two weeks,” he explained. So the Taliban, despite the early claims of a hugely successful election, has now managed to get a crucial delay in the runoff election. Remember that Hamid Karzai has refused to sign the Bilateral Security Agreement that would allow US troops to stay in Afghanistan after the end of this year. Although both Abdullah and Ghani have said that they would sign the agreement, a delay in the winner taking office increases the odds that the US will simply withdraw completely if they feel there isn’t sufficient time to plan for the number of troops to leave behind.